Club Captain Jan Wikstrom and Ian Palmer recently drove to Adelaide to compete in that State’s Rifle Shooting Championships. 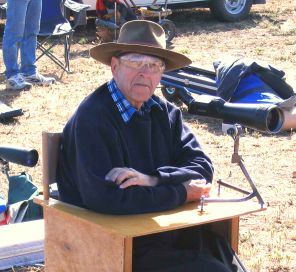 In 2003 the South Australian Rifle Association’s main rifle range was re-located to Lower Light which is approximately 50 kilometres north of Adelaide on the Pt. Wakefield Highway. The range itself is located in very open country approximately 7 kilometres off the Highway. In the Queens shoot Ian was second in the 500 metre shoot on the first day in A Grade. For the three days of competition during the Queens, the winds were particularly tricky and neither Jan or Ian were able to excel in these conditions. The lead up shoot is the Hunt Aggregate and Jan was second in the 300 metre competition in B Grade and Ian won the 300 metre A Grade competition. Ian also equal top scored for the day 1 aggregate with 148.16 and was successful in the shoot off that was conducted on the following day. On day two of the Hunt Aggregate, competitors were greeted by particularly strong and buffeting winds estimated to be around 40 to 45 kilometres an hour. Jan won the morning shoot at 600 metres in B Grade with a very creditable 50.6. 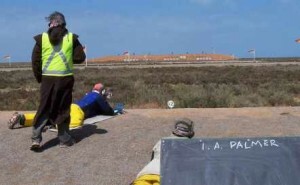 The long range shooting was cancelled in the afternoon due to the possible damage that could result to the targets and the final range in the competition was held at 300 metres. Both shooters are looking forward to the opportunity of competing in Adelaide at some time in the future.